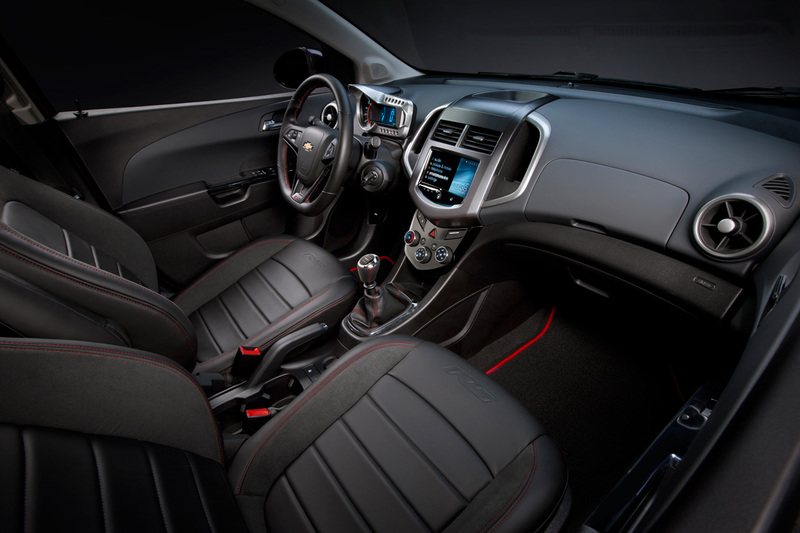 The bowtie brand has decided to give the children in all of us a bit of an early Christmas gift in the form of the 2013 Chevrolet Sonic RS. Nothing could have been more appropriate than a hot hatch. After all, this sort of car only appeals to boy racers and older individuals who still have a child speaking out inside them. Getting back to the car, the 2013 Chevrolet Sonic RS is a turbocharged pocket rocket that just looks like it means business. Power comes from the same basic 1.4 liter Ecotec turbocharged four-cylinder engine that you find in other versions of the Sonic, only in the RS it was tweaked a bit. The end result is a familiar engine that pushes out 138 horsepower and 148 pound-feet of torque. Not exactly much by today’s standards but the Sonic RS is a light car. In fact, pretty much everything about the 2013 Chevrolet Sonic RS seems to follow the recipe of tweaking and updating every component the hatchback came with. The suspension was stiffened up and lowered, the wheels were pumped up to 17 inch alloys, the braking system was considerably revised and they even upgraded the ABS system. Why offer it only in five door guise? Surely there’s plenty of people out there who’d be interested in a coupe-like three door spec. And also, why improve on the six speed automatic gearbox for better driving feel and do absolutely nothing to treat those who favor a manual shifter?